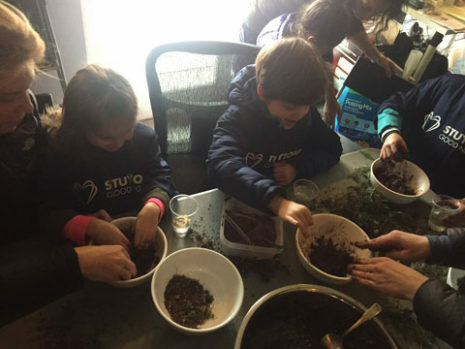 There were children’s activities in Stuy Cove’s new Children’s Education Garden such as planting, transplanting, potting up plants and collecting seed from the native plants which were later used to make seed “bombs”- little soil and seed balls that can be tossed in tree pits or anywhere in need of some wild flowers. Stuy Town also donated flowers to plant in the raised beds around the Solar One office, which added some much needed end of the season color! Elsewhere in the park volunteers weeded, mulched, raked leaves and helped get the compost bins squared away for the winter. Over the course of the morning a tremendous amount of work was accomplished and better yet, everyone really enjoyed contributing and working together. Over the last three years Stuy Cove staff has been working hard to find new ways of bringing the community together around the park, in the spirit of how the park came to be, and this was a very exciting further step in that direction. In many ways the spirit of volunteerism started at the site before the park was even built. Once a debris strewn, vacant parking lot and before that various iterations of industrial storage, people from the community would come out to help clean up the site, picking up trash as it eddied in the winds towards the waters of the East River. When the park was finally built and Solar One took over the care of the gardens, that tradition of volunteering grew. Over the years, and especially in major times of need such as the flooding and damage after Hurricane Sandy, volunteers have come together around this unique space. This year the number of volunteer hours was more than doubled, and many new and exciting partnerships were formed. 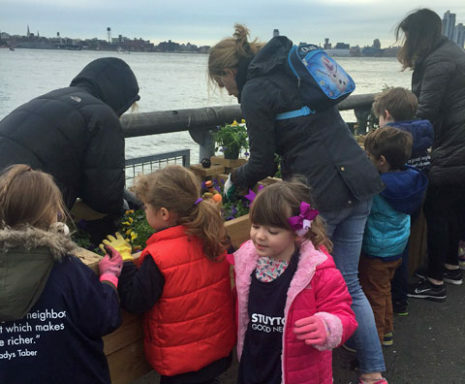 It goes without saying that Stuy Cove would not be what it is without the support and commitment of volunteers, but as time goes on it is important to be reminded of what is possible when the community comes together and that that is what makes Stuy Cove such a special place. Here’s to an incredibly productive 2017 season and many more to come! If you’d like to volunteer in Stuyvesant Cove Park, please email Park Manager Liza Mindemann at liza[at]solar1[dot]org.